On September 1, 1859, amateur astronomer Richard Carrington was using an optical telescope to record positions of sunspots when a sudden bright flash erupted from the Sun. We now know that solar flares can be seen across the entire electromagnetic spectrum, not just in visible light, and are caused when charged particles, mostly electrons and protons, are accelerated to nearly the speed of light and interact with the solar plasma. Observations over the past few decades have shown that during a solar flare, particles are accelerated high up in the solar corona, most likely by a phenomenon called magnetic reconnection. These particles then stream down onto the solar surface (typically over a small area near the active region) where they interact with the Sun's photosphere producing photons ranging from radio to gamma-ray wavelengths. Solar flares typically produce gamma rays over time periods of seconds to several minutes and are commonly tied to the X-ray activity of the flare. The highest energy gamma rays are caused by protons colliding. These collisions create particles called pions that quickly decay into gamma rays. In 1991, the EGRET instrument on board the Compton Gamma-Ray Observatory first observed hour-long gamma-ray emission from a solar flare when all other activity on the Sun had ceased. This left the solar physics community with more questions than answers about how particles could still be accelerated for so long after the flare had apparently faded away. The Large Area Telescope (LAT) on board the Fermi Gamma-ray Space Telescope is so sensitive that we now see ten times more gamma-ray solar flares than before Fermi. We have learned that hour long high-energy gamma-ray emission is fairly common, even from moderately bright flares. In fact, more than 10 of the 40 gamma-ray solar flares detected by the LAT have continued producing gamma rays for at least 5 hours. In one instance, on March 7, 2012, the LAT observed continued gamma-ray emission for more than 20 hours! This record-setting flare was not only long-lived, but it also produced the highest-energy light ever detected during or immediately after a solar flare. 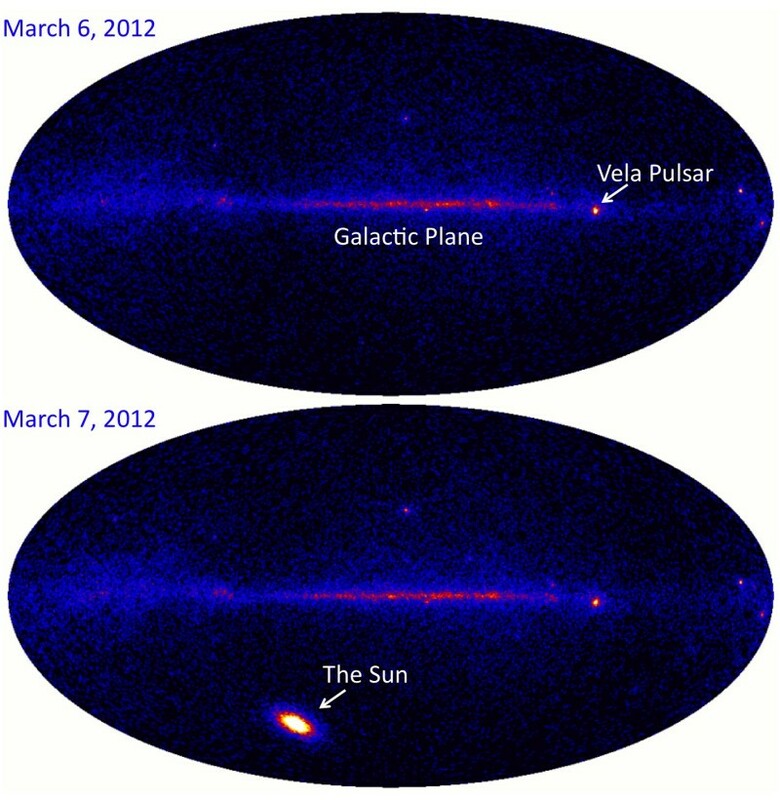 than the Vela Pulsar, the brightest gamma-ray source at these wavelengths. Solar flares are often accompanied by violent ejections of plasma called Coronal Mass Ejections (CMEs) and can release streams of charged particles, known as Solar Energetic Particles. When these explosive phenomena are directed towards the Earth they can cause bright auroras and sometimes disrupt long range radio communication. Scientists believe that the same energy that powers solar flares also drives CMEs, but it has always been hard to find the relationship between these two phenomena. 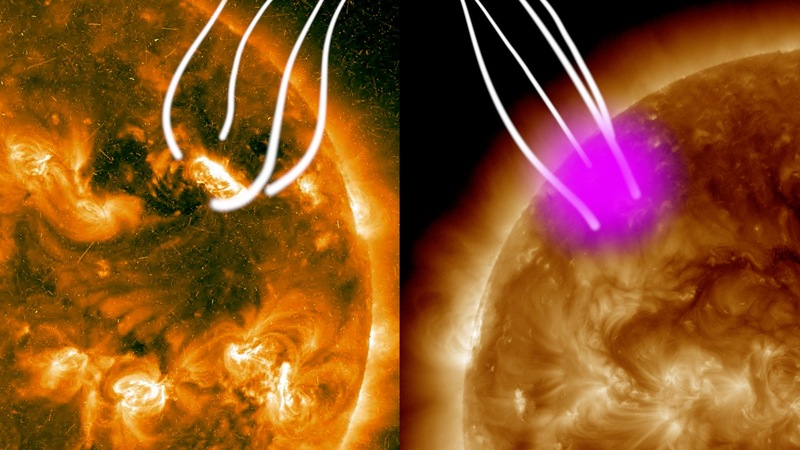 The hour-long gamma-ray emitting solar flares seen by Fermi have all been accompanied by very fast CMEs, which suggests a connection. Fermi-LAT has even detected high-energy gamma rays from solar flares erupting on the far side of the Sun (not visible from the Earth). Some of the flares were near the edge of the Sun's visible disk (called the "limb" of the Sun), but others were much farther away, up to 40 degrees from the limb. Gamma-ray detections of "Behind the Limb" (BTL) flares implies that the energetic particles must be traveling very fast, up to 300,000 miles in just a few minutes. In fact, BTL observations strongly support the existence of a large component in solar flares that must travel far away from the active region in order to interact with the visible portion of the solar disk. This idea is also supported by the gamma-ray localization provided by the LAT. For the brightest flares, the LAT is able to provide information on the region from which the emission originated. In the case of the March 7, 2012 flare the emission lasted so long that it was possible to make time resolved localization illustrating that the emission centroid moved across the solar disk (away from the active region) as time progressed. Fermi-LAT has observed the entirety of the most recent solar cycle, collecting data from 40 solar flares at high energy, the largest catalog of high energy flares to date.